Info "Goma the snail needs to eat leafy greens to grow big! Help it grow!" Leafy Greens is a microgame found in the Nature folder in WarioWare, Inc.: Mega Microgame$!. The term "leafy greens" is alternative name for leaf vegetables. 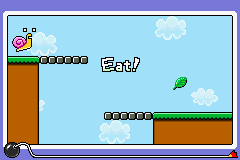 The objective of the game is to get the snail moving to the other side by jumping from platform to platform and leap up to eat the leaf. 1st level difficulty: The player doesn't have to jump to get to the leaf. 2nd level difficulty: The player must jump once to get to the leaf. 3rd level difficulty: The player must jump twice to get to the leaf. This page was last edited on January 4, 2019, at 16:25.